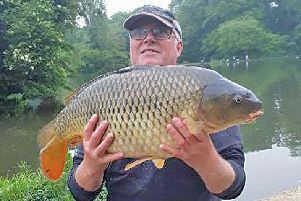 And for Stanwick regular Gordon Gurney, coming back to that fishery following several weeks off, that reward was a massive new PB and record for the complex. Known as the ‘colonel’ (it’s a long story, don’t ask) the mint-condition common turned the scales all the way to 51lb! And for Gordon it was renewing an old friendship as he had banked the fish three times before over the years, to a previous high of 49lb. Stocked into Stanwick at around 25lb 12 years back, it has obviously undergone some hefty growth-spurts’ since then. In its early 30s, it is not the oldest fish on the complex. 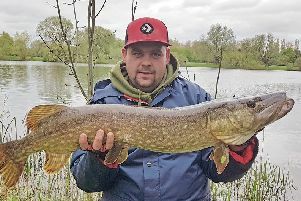 That is spike – a pot-bellied mirror recorded as being at least 40 years old, and which was caught at 37-8 at the weekend by Jordon Coles. TOWN supervet Bob Church took 10 ‘selected Cobblers supporters’ to enjoy buzzer fishing on Elinor – landing 124 trout to 4-2 between them as a great day was had by all. ROYAL Oak had a ball on Meadowlands with 100lb just enough to make the top-ten. Pete Caton won with 232-4 ahead of Charlie Merritt 219-10 and Richard Shiner 179-10. TWO rounds in Ringer Baits are within grasping distance of the Sonubaits feedermasters super league – one point adrift of leaders Dambusters. Ringers’ Rob Wootton made second in Sunday’s Southfield reservoir leg with 24lb of bream. WHITE Hart Flore oldies, Tofts: Jeff Wiggins 101-12, Tom Griffiths 62-6, Ted Adams 51-14. MILL Lane, Wold Farm: Alan Byrnes 101lb, Gary Abrahams 94-10, Ken Andrews 88-8. WHITE Hart Flore, Barby Banks: Mark Forbes 69-8, Rupert Wickham 67-8, Nick Wheeler 66-8. CASTLE Ashby: midweek, Frank Pizamenti 34-12, Nigel Baxter 31-4, Lee Jones 29-8; Sat., Keith Garratt 48-8, Mick Hewlett 46lb, Pizamenti 36-12; Sun., Grendon, Pete Rawlings 39-12, Pat Oneil 29-6, Bob Reed 29-4. FLORE & Brockhall: Rob Rawlins 66lb, Jim Tanser 58lb, Terry Smith 52lb. CROCKETT & Jones works do, Peatling Parva: Gary Wilmott/Barry Scrivens both 34-4 (barbel) Paul Minney 34lb. COUNTY Vets, Canons: Dave Cantrell 17lb, Paul Lafflin 16-10, John Lewis 14-12. CASTLE silverfish league final, Canons: Pete Laughton 12-7, Paul Lafflin 12-2, Jeff Rice 11-2. Rice and Chris Rose tied for series top spot. TOWCESTER/Nene, Rothersthorpe canal: Chris Howard 2-1, Mick Goodridge 1-11, Tosh Saunders 1-9...including a 1-6 eel! FIXTURES: June 22-24, Charity fest, Linford Lakes, six places left.